Pakistan Post issued new stamps on 12 different occasions during 1970. 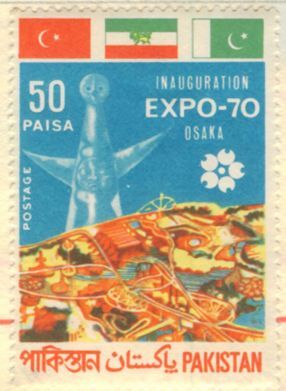 The first stamp above was issued on March 15 on the eve of the World Fair Expo-70 held in Osaka, Japan. The 50 Paisa stamp displayed flags of the three RCD countries (Pakistan Iran and Turkey) on the top. Underneath the stamps were a sun tower and Expo site map. The second set of stamps was issued on May 20 to commemorate the opening of the new headquarters of the UPU headquarters building. The stamps valued at Paisa 20 (above left ) and 50 (above right) showed the new building of the UPH headquarters. On the eve of the 25th anniversary of the UNO, a set of two multicoloured stamps were issued on 26 June 1970. The Paisa 20 stamp (above left) showed the UN building in New York, while the Paisa 50 stamp (above right) displayed UN emblem. 1970 was the International Year of Education, celebrated the world over. On the occasion, Pakistan Post issued a set of two stamps on July 6. The stamps of value Paisa 20 (above left) and 50 (above right) displayed the emblem of IYE, book and a pen. 6th anniversary of the Regional Cooperation for Development (RCD) was celebrated on 21 July 1970. Pakistan Post issued a set of three stamps on the occasion. The Paisa 20 stamp (above left) displayed the spectacular and awe inspiring Lake Saif-ul-Muluk of Pakistan. The Paisa 50 stamp (above centre) displayed the famous See-o-see pol (bridge) of Iran,located in the historic city of Isphahan. The Re.1 stamp (above right) displayed the scenic view from Fethiye, Turkey. 18th August 1970 was celebrated as the Asian Productivity Year. The Pasia 50 stamp above with the Asian Productivity symbol was issued on the occasion by Pakistan Post. 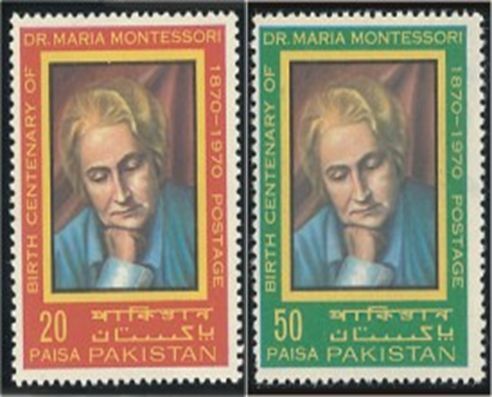 The death centenary of Dr Maria Montessori, the pioneer of Montessori education system, was observed on 31st August. 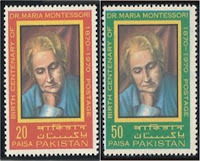 A set of two stamps of value Paisa 20 and 50 was issued by Pakistan Post displaying the thoughtful portrait of Dr Maria Montessori. 10th FAO Conference for the Near East was held at the Pakistani Capital Islamabad on 12 September 1970. On the occasion, a stamp of value Paisa 20 was issued displaying a tractor and a fertilizer factory. 5th October was observed as the Universal Children Day. 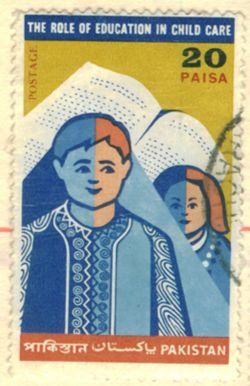 Pakistan Post issued a Paisa 20 stamp on the occasion, displaying a boy and a girl with an open book in the background. In December 1970, hallmark elections of national and provincial assemblies were held. If the outcome of the elections, which were largely believed to be the most transparent and independent in the history of the country, were upheld in their true spirit, the later events that led to the separation of East Pakistan would not have arisen. But due to the personal gains of the politicians of the time, Pakistan had to suffer very badly in events during 1971. 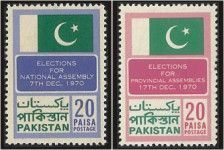 The 20 Paisa stamp (above left) was issued on December 7, 1970 for the holding of elections of National assembly, and the 20 Paisa stamp (above right) was issued on 17 December 1971. Ironically, it was the same month a year later when East Pakistan became Bangladesh. The last stamp of the year was issued on 28 December on the eve of holding of the Islamic Conference of the foreign ministers at Karachi,Pakistan. 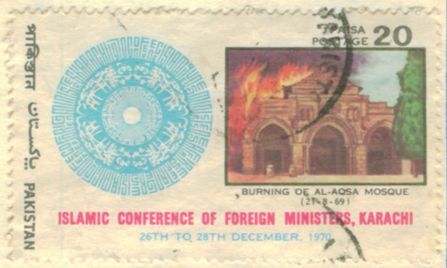 The stamp valued at Paisa 20 showed the conference emblem on the left and the burning Al Aqsa Mosque by the Israelis, on 21 August 1969, on the right. Most of the stamps above are part of my stamps collection.